Even if your code is 100% RC0 'compatible', you need to re-compile your Silverlight assemblies with the RC0 Silverlight Tools for Visual Studio. 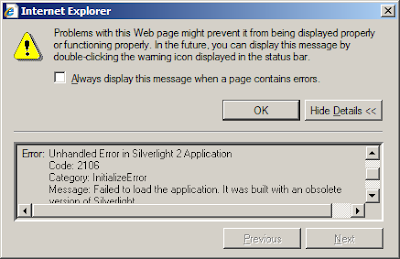 For example, SilverlightEarth.com/2 is updated for RC0, and SilverlightEarth.com/2b2 still hosts the beta2 bits. Although no code changes were required (or made), there a minor visual differences that I have yet to correct (the height of the radio-button StackPanels, for example). Virtual Earth - DeepEarth - Deep Pockets. Basically it calculates a cost of approx. 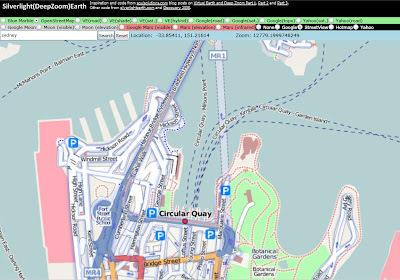 $1.25 per viewer if licensing Microsoft's Virtual Earth tiles for use in DeepEarth (Silverlight 2.0 map tile client)... although Microsoft can't be too concerned since they have it listed in their Community Gallery!